Getting to the University of Huddersfield and staying in the local area couldn’t be easier, with rail links directly from Manchester International Airport and easy access from major motorways. The local area provides a number of hotels and accommodation types to suit every budget. 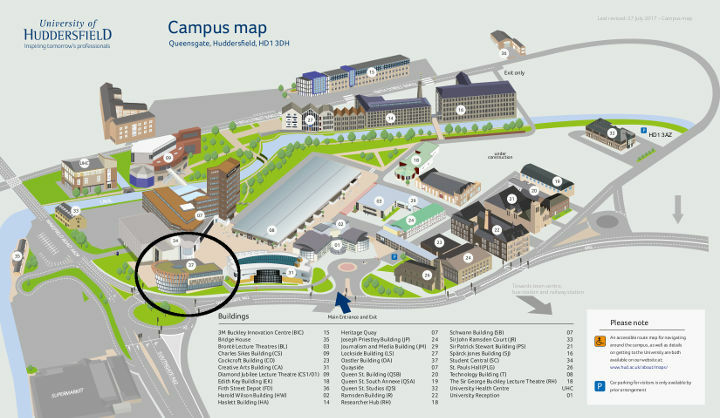 EMiT2019 will be held in the Oastler Building, which is highlighted on the campus map below. The University is a 10-minute walk from Huddersfield train station. You can use the Huddersfield free town bus that passes by the bus and train stations and stops near the University’s main entrance. Further information about this bus and its key stop off points can be found on West Yorkshire Metro website. You can book your train ticket to Huddersfield from any UK train station or on the Trans Pennine Express website without paying a booking fee. For detailed instructions on how to get to the University from Huddersfield train station please check the Google Maps walking directions. The University is a 7-minute walk from Huddersfield Bus Station. You can walk to Huddersfield train station and use the free town bus that stops outside the train station and drops you off at the University. Further information about the free bus service can be found on the West Yorkshire Metro website. For more detailed directions from the Bus Station to the University please refer to the Google Maps walking directions. If you are arriving to campus on foot and have a smart phone, use our postcode HD1 3DH as your destination and follow the directions on your phone. If you don’t have a smartphone, you can download and print a Google map of Huddersfield town centre where the University is located. Alternatively, you can use the free town bus that passes by the bus and train stations and stops near the University’s main entrance. Further information about this bus and its key stop off points can be found on the West Yorkshire Metro website. Huddersfield is located in West Yorkshire between Leeds and Manchester with good connections to the M62 and M1, and within easy reach from the rest of the UK.